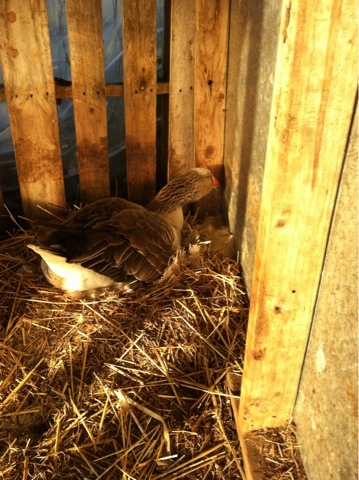 The geese have gone broody. The female made her nest if February, laid a few eggs in it, flattened the nest, ran around for a bit: and now has filled a new, large nest with eggs and is on it all the time. The male is quiet now, after a couple weeks of highly vocal and aggressive interactions. He is quietly watching the pens with the chickens in them while she is solid on the nest. While we were working on vegetables the geese had a short interaction..honking and calling back and forth to each other. Briefly. This is the first year she has done this..first time she has laid a clutch of eggs and then really sat on them. Last year she left them sit for much longer, it appears that now she has this figured out. We will know for certain in 30 days or so, when the eggs start hatching. It is written that while she lays an egg a day in the spring they all hatch at the same time, typically within a 48 hour timeframe. She can take them all swimming just a few days after that. 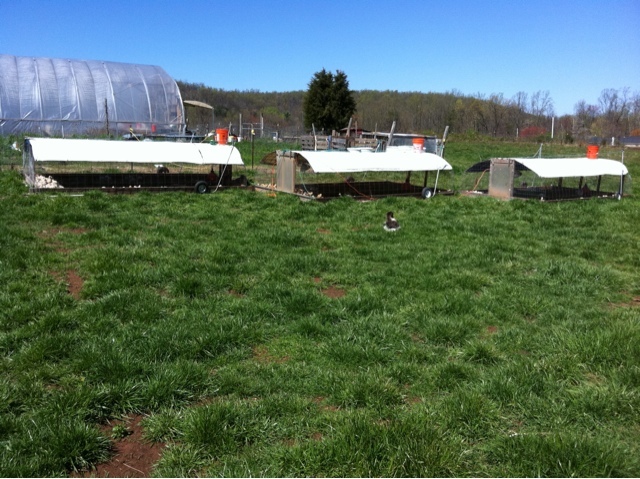 He steps in and guards then, almost always placing himself between the gaggle of geese and anyone/anything else.